Do you have images of Star Wars kits you'd like to share? Contact us! 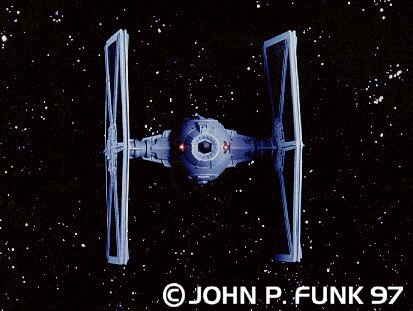 Sienar Fleet Systems' Twin Ion Engine (TIE) Fighter. This craft is the familiar backbone of the Imperial fighter fleet, first seen in ANH. Though lightly armored and lacking shields, it's still a formidable opponent in a knife fight. It's also the basis for any number of variants - including the droid-piloted TIE/d and a land-based tank! In addition to the AMT kit, there were MacroTrek (resin) and an Estes (vacuform model rocket) kits available. Sienar Fleet Systems' TIE Interceptor. The Interceptor is the Empire's answer to the A-Wing - small, nimble and well-armed. It is a direct descendant of the TIE/Advanced protitype flown by Darth Vaser in ANH. Like the A-Wing it has only been seen in ROTJ. The most widely available model is AMT's small, snap-tite kit. This ship is also found in the three-fighter ROTJ re-issue kit. Sienar Fleet Systems' Advanced TIE This craft is apparently an experimental upgrade of the standard TIE, with more firepower and (atypically) shield generators. It has only been seen once, as the craft Darth Vader flies in ANH. MPC issued a model of this craft which has since been reissued by AMT/ERTL as an In-Flight Display kit (and lately includes paints and other model supplies). Steve Neisen has kitbashed a stunning Scratchbuilt TIE Bomber using this kit. Sienar Fleet Systems' TIE Bomber This craft shares little commonality with the TIE fighter series, appearing to be an all-new vehicle. Like the TIE/Advanced it has only been seen once, as the craft bombing the asteroid field in EST. ILM used the solar panels from the ERTL/MPC kit of Darth Vader's TIE/Advanced when they built the studio model for the film. Steve Neisen has kitbashed a stunning Scratchbuilt TIE Bomber using the ERTL kit. Kuat Drive Yards Imperial -class Star Destroyer . The behemoth first seen in ANH. The original kit can still be found in some hobby shops and outlet stores, as can the later (and more expensive) fiber-optic kit. Major complaints are the lack of detail on the bridge module, poor fit (an AMT trademark!) and innacurate shield generators (the globe-like things above the bridge - replace these with multi-sided role playing game dice for better appearance). Sienar Fleet Systems' Lambda-class Shuttle. The shuttle appears to be a workhorse of both Rebel and Imperial fleets, somewhat akin to the C-47 or C-131 aircraft. Only one example, the Tyderium, appeared on screen - as the captured craft that takes a Rebel assault team down to Endor. The AMT Shuttle Tyderium is a huge kit - at least 18 inches tall with fins extended! The more recent Revell kit is a more manageable size. 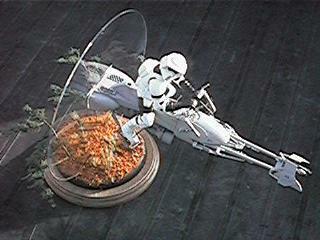 Speeder Bike. Used by the Empire's scouts and riot-control police - their version of the motorcycle. AMT has reissued the original kit as a 'Flight-Display' (throwing in a cheap base and a piece of plexiglass so they can jack up the price). This is a large kit - the stormtrooper figure is over 6 inches tall! All-Terrain Armored-Transport (AT-AT). The Empire's equivalent of an armored personnel carrier is a huge, lumbering monster that looks a lot like a mechanical cow .... with a very bad attitude. In addition to massive firepower, it can carry a good sized complement of troops - as seen in the Hoth battle scenes in EST. Available kits of this behemoth include the ERTl "Structor" mechanized kit and the Battle for Hoth diorama - which includes three 'walkers', one of which is destroyed. There was a larger kit available at one time which can still be found at conventions and shops that stock OOP kits. All-Terrain Scout-Transport (AT-ST). The Empire's smaller (two-man) 'armored car' vehicle, seen in the Endor battle scenes of ROTJ. A snap-tite kit was re-issued during the 20th Anniversary merchandising frenzy, as well as toy-like 'Structor' kit (avoid this - the Kenner toy is better). Trade Federation Droid Fighters. The Trade Federation are a collection of merchants who use their droid armies to grab more market share. Their main weapon are these nimble fighters. They're bad. They're droids. And they fly through space. The "wings" split into legs (it walks on the tips) and the "cockpit" folds back into a head. See also Robots & Vehicles section for Trade Federation Infantry and Tanks. The Star Wars universe teems with beings and cultures - not all of whom are neatly aligned with either Empire or the Rebellion. In addition to the bounty hunters seen in EST, there are any number of smugglers, pirates, rogues and scoundrels populating the movies and the many books. Some of these have even made their presence known in model form. Kuat Systems Engineering Firespray -class Patrol and Attack Ship (Modified) . Boba Fett's unique starship, heavily modified with a host of illicit and downright illegal weapons and sensors. Two versions of the ship are still available in the US, a regular model molded in grey styrene and a chromed 'Special Edition' kit. Cult TV Man's Sci-Fi Modeling: An rich library of sci-fi modeling subjects (mostly spacecraft) with a good concentration on Star Wars. Updates often. Millenium Falcon: Ship of Riddles: Rob Brown's exhaustive analysis of everyone's favorite tramp freighter, with tons of pictures, drawinga, diagrams and more. The Blockade Runner: Rob does for the Correlian Corvette what he did for the Millenium Falcon. B Squared's Star Wars Stuff: Parent site of the preceding. Lots of studio model and set pics along with a lot of philosophical and technical explanations. This page made possible by Starship Modeler - copyright © 1997-2009.